Kapoor Hall, of University at Buffalo, was occupied by the Chemistry Department up until 1994, when the Chemistry Department was moved. The building remained empty for over a decade. 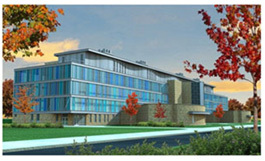 In 2007 Kapoor Hall was approved for renovations that would turn the 160,000 square foot structure into a state-of-the-art School of Pharmacy and Pharmaceutical Sciences. Renovations are expected to be completed by August 2011 and to cost $65 million. KEC's primary objective was to design the strengthening system that would allow the existing columns and slabs to carry additional loads. Other objectives include strengthening of existing openings and patched openings. For strengthening projects, we generally use fiber reinforced polymer (FRP) laminates, which provide a high-strength and lightweight material that is easy to install. In this project we made use of both glass and carbon FRP for column and slab strengthening, respectively. Since the structure is so large, many unique designs were required, although our design software, which we created in-house, made small work of them.